“I’m too young.” Some younger people think they can’t make tons of money online but this is a wrong belief. There are many teens out there who made millions before they turned 20. A few examples are Ashley Qualls who founded WhateverLife.com, Juliette Brindak who founded Miss O & Friends at 16, Sean Belnik who founded BizChar.com and so on. Hence, there is no minimum age to become a millionaire at all. If you are wondering how to make money online as a teen, legally and effectively just like many others, read on and find out. How to Make Money Online Legally and Effectively as a Teen (Under 18)? Though it is illegal for teenagers who are yet to clock 18 to engage into any job in some country, but from my own point of view, I believe it is better to start early so that you can learn early. The thing I love about the Internet is the lack of Age Discrimination – no matter if you are a teenager (or even younger) or someone who is long retired the Internet provides opportunity for all. First of all, there are many ways to make money online as a teen. However, not all of them allow you to generate a sustainable income online. Most importantly, a lot of them are not legitimate. If you are looking for ways to earn some pocket money online. I would recommend online surveys. Online surveys are great for a bit of cash. If you have no experience online at all, then surveys are a good place to get started, get familiar with. With surveys, you get paid to answer questions, give your own opinion and feedback. The amount you earn can be anywhere from a few cents to a few dollars per survey, although you may sometimes stumble across individual surveys that offer more. For the most part, survey sites are legitimate. So, you can actually earn money through them. The idea even works well for teenagers because the rewards are often in the form of gift cards, which are easy to redeem. But, survey sites are fairly limited. The biggest problem is time versus income. In particular, you’ll often find that you average only a few dollars an hour for the time that you spend doing the surveys. To make matters worse, you would also get screened out of many surveys as a teen, and it can sometimes take days or weeks just to get one new survey. I am not going to beat about the bush. If you intend to make a sustainable and passive income online without working nine-to-five, affiliate marketing is the answer from me. Before I start, I would like to make one thing clear here. I do not believe in easy money and there are no magical tips in this article that will help you get rich overnight. So if you are after easy money through affiliate marketing, then this article is not for you. 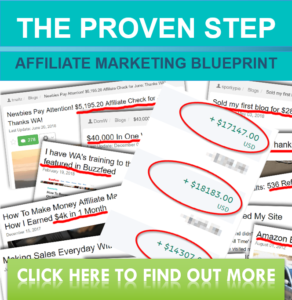 A lot of people jump into affiliate marketing without understanding anything about the industry and quickly end up getting disheartened and give up. Then they claim affiliate marketing is a total scam, of which that is a wrong belief that these people are telling you. Affiliate marketing is an effective business model that allows publishers (affiliate marketers/ bloggers) to monetize their blogs. It is a revenue split in the profits when a product or service is sold. Basically, you get a cut of each sale made by sharing someone’s products on your website or social media (Facebook, Instagram or Pinterest). That means you can find and represent products that you love and endorse them to your readers and receive some commissions from the companies (Amazon, ShareASale, CJ Affiliate, eBay and etc). Affiliate programs normally provide unique tracking URL’s under your account. These unique links automatically take care of all the tracking and reporting for you, again reducing the headache or overhead needed on your side. You can be an affiliate of almost anything: solar panels, airfare, car rentals, job search websites, legal services, hosting, you name it. And some of those items have ridiculously high commissions per sale. Start up costs are super low. Many brick-and-mortar businesses require a big start-up capital to begin a business. As for affiliate marketing, the start up cost is pretty low, especially for teenagers. To start a regular business where you rent retail space and stock inventory could easily set you back tens of thousands of dollars. As an affiliate, you can get started for the cost of a burger and fries. Other than that, you don’t need any staff to run your business. You can do it all yourself. Even if you want to grow your business in the future, you can always outsource. You don’t even need a product you simply have to promote products which are already for sale. Whether it’s an eBook about dog training your or a weight loss supplement – there is a product out there that you can sell as an affiliate. One more thing, you don’t need to worry about inventory, storage or shipping cost, all these will not be handled by you. The opportunity to work your own hours. I’m not saying that you’ll be sitting on a beach and working only an hour a day after your first month as an affiliate. However, you do have the power to work when it suits you and have a more flexible life. It is estimated that the affiliate marketing industry is going to be worth $5.97 billion by 2019. It is growing at an incredible pace. Amazon, Apple, HP, Best Buy, Etsy… you name it. Without affiliate programs and affiliates, these companies would have WAY less market share online. The likes of Amazon have built their empire off of affiliates, it is rare these days when doing research on a product or service you don’t come across an Amazon affiliate site. Everyone can be an affiliate marketer, even if you are under 18. There may be some affiliate programs that limit their affiliate age to 18, there are over 500 million products/ services that you can sign up. This subset of products only continues to grow, not to mention the 100,000’s of online and offline services that also have affiliate programs. Example: Doug was just 18 yer-old when he made over $6,000 per month through affiliate marketing. Most of his earnings came from Amazon and a few other programs. It’s really inspiring, no? Click and read his story here. Experts will constantly tell you to blog about what you’re passionate about. However, you can’t pick a niche just because you like it. There are several other components you have to look into when choosing your niche. A good niche is one which is related to what you like, has good traffic, and also has a monetary value. More than that, your niche should have a future. Let’s say you already have an idea about what you are going to blog about. The next thing you need to check is to figure if it is a profitable niche. You can fire up Google Trends and check for ideas that are increasing in search queries. Google Trends tool shows to the trend of product/niche ideas based on total search volume, starting from 2004. Not only it shows the total search volume, but it will also display the countries and cities that the ideas are most popular in. For instance, smartwatch/ fitness tracker is projected to exceed 110 million units by 2020. Ever since early 2012, it has gained significant interest from the public. World’s technology giants like Apple, Garmin, Vivoactive, Samsung Gear etc. have introduced their own smartwatches to be synchronized with their smartphones or other compatible devices. Domain names will cost you probably $10 per year. You can register your domain at places like NameCheap or GoDaddy. This is a fun part as your website name is your brand. It is how you will be remembered. TIPS: If you have not made up your mind, you could try setting up a website and get a domain for free with SiteRubix. It is mainly for newbies to get the first taste of owning a website with your desired domain name. Before you create your first content, you need a publishing platform. ManagingYourFinance.com uses WordPress, of which it is a free and open-source content management system (CMS) based on PHO and MySQL. In short, it is free, user-friendly and powerful publishing tool. WordPress is the most powerful and widely used website platform in the world. It is used by over 30% of ALL websites (millions). Select the domain that you wish to install WordPress. Once you have a website set up with WordPress. You should then install some free SEO plugins that will help your site ranked faster on search engines. Read How to Make Money With a Blog for Beginners (Step by Step) to find out more. There are several rules in writing articles, mainly one for search engines and one for your readers. “SEO” refers to search engine optimization or the process of optimizing a website so that people can easily find it via search engines like Google. By content for readers, we mean any information that lives on the web and can be consumed by your audience. SEO is a big topic and I am going to outline a few key components about optimizing your content for search engines. Keyword Research: If you want to generate traffic through organic search, it’s best to do keyword research before you start writing. This way, you can focus on keywords for which a certain amount of search volume already exists – in other words, write toward topics that people are already searching for information about. Keyword Optimization: Know where and how to use keywords in your content for maximum searchability. Jaaxy keyword toolbox allows you to perform this task. Content Promotion: Increase visibility to new content you create by sharing it on social networks and building links to your content (both internally and from external sites). So if you’re a teen I have no doubt that you know how to use Facebook, Twitter, Google + and just about any other social network. I also have faith that you could learn any new platform if needs to. It is essential to write and publish articles that generate sales like a cash machine. Affiliate marketers make money through affiliate programs. However, many of us find it challenging to publish content that converts to sales. No doubt, the best way to monetize your site is to review a product you love and showing your audience how it could help solving their problems. Along the way, you make a commission when they make a purchase clicking your affiliate link while reading through the article. There are several ways to increase your hit rate to convert traffic to sales. You can read my post for more information on How to Write a Product Review That Generates Sales Like a Cash Machine. Depending on your niche (from Step 1), there are millions of affiliate programs out there in the markets that you can easily sign up for FREE. If you are passionate about Virtual Reality as a gamer, chances are you have preferred headsets, consoles, etc for a reason. Start with those products. Not only will they be the easiest to write detailed reviews for, but people want to use the same gadgets, tools people they want to emulate too. If you have difficulty to find an affiliate program for your niche, use Amazon to find in-demand products. Affiliate marketing is by far, my favorite way to earn passive income online. The beauty of becoming one is you can become an affiliate marketer of many companies. Each of them has different commission rates and there are almost unlimited products and services that you can earn money from. Once you have started your website, you are literally running a real business that has an enormous potential to grow. It is not uncommon to run a website that generates six-figure income per month. It’s not difficult to learn, and it doesn’t need to take long to start earning some cash. It is fairly easy to build an affiliate marketing website and make money online as a teen, because you have been exposed to the internet, social media and many other technologies that allow you to scale your earning. If you want to make money online as a teenager, then, the first advice I will be giving to you is that you try to schedule your time. How many hours of the week are you ready to give to your Online Job without it affecting your education? I know this might not be easy for you to decide, but just try to have a personal timetable. If you can spend minimum 1 hr a day and if you are good at writing, start a blog and post quality content every week. It is not difficult at all to make money online as a teenager. There is no minimum age to become a millionaire at all. If you are wondering how to make money online as a teen, legally and effectively just like many others, read on and find out. UserTesting Review: How Much Money Can You Make on UserTesting? Quickpay.Today Review – A Scam Or Can You Make Money? Next story How to Buy Bitcoin With Credit Card or Debit Card Instantly With Coinbase? Previous story Should You Invest in Ethereum and Where to Buy Ethereum?